Heading into (what should be) the wetter season and with the drought still top of mind, now is the perfect time to start harvesting rainwater for your garden and do your bit to save the planet. The simplest way to collect water is to use household items you already have. Place inflatable children’s pools, watering cans and buckets outside and allow them to fill up with rain. Use this water within a week to discourage mosquito breeding. Or pour into a sealable tank to prolong its use. Routing water from your gutters through the downspout into a water tank is the most efficient way to catch rain. The roof of an average house could yield approximately two kilolitres of water in an hour of moderate rainfall so opt for a large barrel or tank with a cover and screen to keep mosquitoes, animals and children out. Keep gutters clear of debri and insert a filter before the water reaches your tank. Add water storage containers that are separate from your collection barrel if you plan to stockpile the harvest, and make sure not to place tanks near utility services or septic tanks. 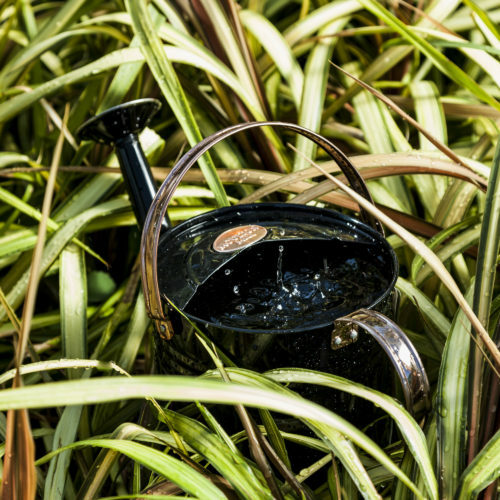 To use the water in your garden, install a tap (beforehand) or use a syphon. Increasing the organic matter in soil will allow it to increase its capacity to store water, meaning you’ll have to water plants less regularly. In some cases, this method may enable soil to store more water than an average-sized water tank. You can easily implement this in a plot in your garden, then plant a rain garden to reap the rewards. First, redirect water to the soil through gutters and the downspout. Add five centimetres of compost to the soil bed and dig it into the topsoil. Rains chains are linked vertical chains installed at the hole in your gutter where your downspout would have been. They are available in various designs and substances such as copper, aluminium, plastic, glass and natural materials. As rain runs through your gutter and to a rain chain, it can be diverted to plants in your garden, cisterns or vegetable plots so that you make the most of your harvest.